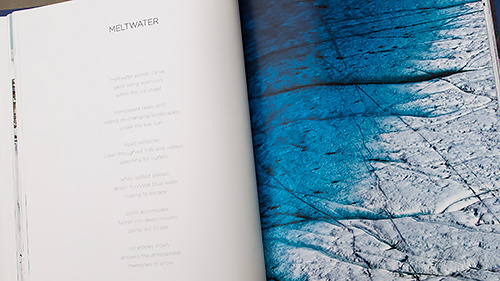 The full title of this large format (10x13-inch) portfolio is The Arctic Melt: Images of a Disappearing Landscape. But we're running out of time to read full titles. Our ice caps are melting. Diane Tuft is an accomplished photographer with works in the permanent collections of the Whitney Museum of American Art, the International Center of Photography and the Parrish Art Museum. So what is she doing jumping into planes, boats and the one available helicopter to shoot the Arctic Ocean's sea ice and icebergs or the ice sheet over Greenland? It isn't to make pretty pictures of ice. It's to continue her "visual record of atmospheric effects on the Earth's landscape," as she puts it. Something she's been doing since her first photographic series in 1998. 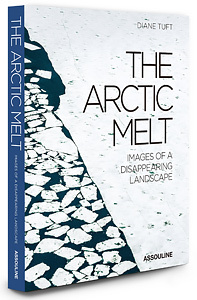 And, indeed Arctic Melt includes images beyond those she shot in 2015 and 2106 when she was compiling material for this book. She revisits a few scenes from her 2007 visit, showing us the difference between then and now. No matter where you live, you may have noticed a few changes yourself. Birds you have never seen before, for example. Or the absence of birds you used to see. Storms that last longer than they used to. Droughts. There are "magical thinkers" who can explain all this away as a hoax by the Chinese but they are, as Herman Melville put it so eloquently in The Confidence-Man, His Masquerade, "profane fiddlers on heart strings." I began my Arctic exploration on June 4, 2015, at 78 degrees North in Svalbard, an archipelago in the Arctic Ocean located halfway between mainland Norway and the North Pole. Most of Svalbard's twenty-three thousand square miles remain untouched by civilization, and the majority of its twenty-six hundred inhabitants live in Longyearbyen, the world's most northernmost settlement. After great difficult arranging to rent the only helicopter in Svalbard, I was able to access the region's mountain glaciers and surrounding waters. That wasn't the end of her difficulties. Her visit to Ny-Ålesund, an international research center, required the invitation of a scientist working there. Vittorio Pasquali from the National Research Council of Italy stepped in to sponsor her. She also hopped aboard a Russian nuclear-powered icebreaker to travel through the Arctic Ocean to the North Pole. "While this was an amazing experience," she writes, "it disturbed me to know that my trip through the Arctic Ocean was only possible because of the Arctic melt." In the Acknowledgements that close the book, Tuft thanks her assistant Kirsty Reeves who "was indispensable in helping me manage my cameras and other equipment in extremely adverse conditions." Never, we suspect, has an assistant endured so much. But the reward is in the pages between the Foreward and Acknowledgements. The series of images is stunning, with comparisons shots, double spreads and even (oddly) some black-and-white bitmapped images that recall dot-matrix printer output. One thing we looked for from page to page was a consistent white balance. And as we paged through, we were impressed to see how consistent it was. 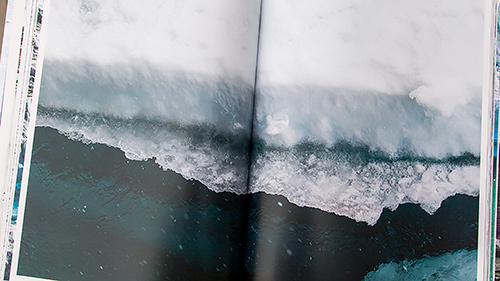 Then we came to a spread that ranged from a warm white in the sunlit snow to the cool white of submerged ice. That really impressed us. Care was taken not only with the images, but with the binding. It's an expensive book but it isn't cheaply produced. It's the first photo book we've seen in some time with sewn bindings. That helps the book lie flat so you can enjoy the spreads without the huge distortion of that page curl in the middle you get with a glued, perfect bound paperback. Joe Romm, founding editor of Climate Progress, wrote the Introduction, noting, "We are leaving very deep and dangerous footprints in our short walk on this planet." And Tufts has documented with searing imagery the damage being done. For which even magical thinkers owe her thanks. Seeing, after all, is believing. 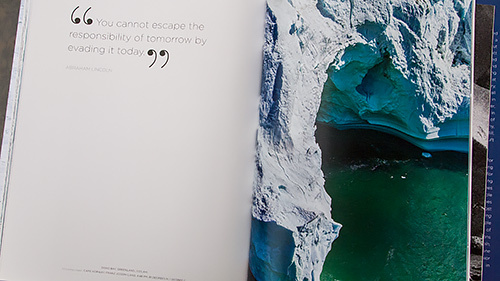 The Arctic Melt by Diane Tuft, published by Assouline Publishing, 176 pages, $95 (or $72.71 at amazon.com).